Music Business Contracts: Do you need music industry contracts? Music industry contracts at your fingertips! Do you need music industry contracts? 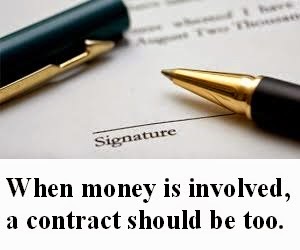 Having the right contracts when doing business in the music industry is very important. We are now providing you the opportunity to have many different contracts at your finger tips. Dealing with other artists, record labels, managers, and clubs is a situation where you should have a contract ready. This will ensure good business on both ends of the agreement. Of course having a good entertainment lawyer is a must too. Yet, many indie artists will draw up their own contracts for simple deals. Upon payment, you will get a link to download a zip file that includes a PDF, and DOC file of each contract template. This way you can add or delete what is needed in each contract you use. 12 contracts in all for your use. Perfect for independent artists, independent record label owners and more. This is an instant download. Take advantage today! Your site is truly cool and this is an incredible motivating article.